This excerpt from Chantal Boulanger's book comes as an example of women's openness and pride in their local drapes. "For instance, the Kappulu sari, one of the most interesting and elegant drapes I have found, is worn only by old women of the Kappulu caste. I noticed it completely by chance on a woman crossing the road outside Masulipatnam (Andhra Pradesh). Although I had crisscrossed the region asking as many people as I could if they knew different ways of draping, nobody had said anything about this style. As we were going back to Vijayawada, a woman crossed the street right in front of our car. My driver turned towards me and said: Do you know how to drape this sari? To my surprise I realised that I had no idea such a sari existed. We found the woman in a roadside tea shop, and she had no difficulty in teaching me the drape. It took me an unusually long time to grasp the intricacies of a sari which is quite unique, and which couldn't fit within any of my classifications. I have never seen this drape outside this village. This anecdote illustrates the need for a thorough survey. I also understood that day that I would never be able to complete my work. 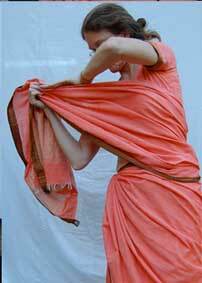 I have asked many women to teach me how to drape their saris. Most of them were unknown to me, and I had simply met them in the street. None refused and every one of them, from the educated Brahmin to the illiterate tribeswoman, understood what I was doing and why. They were all pleased with my work and entrusted to me their knowledge with pride." 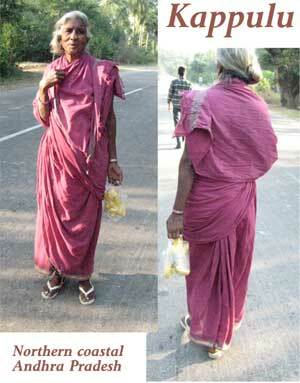 In Srikakulam and Ponduru I saw a few women wearing this drape. On the way back from Ponduru the taxi passed by this incredibly elegant woman. I just had to stop and talk to her. I tried to convey how much I liked her Kappulu sari, but she didn't recognize that name. She politely agreed to let me photograph her. The Kappulu is such different type of drape, with an almost Grecian flair. The endpiece passes around the body twice in two graceful cascades of pleats. A few narrow pleats in the back give a beautiful emphasis to the form - it's really flattering! 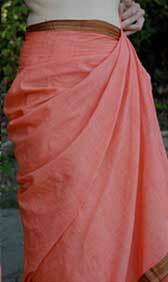 To get the best effect you should use a longer length sari, 7 yards is optimal. If you are plus size a 9 yard sari will work well. Many sarees come with running blouses you can leave for the extra length, and if you are very slim you can just get it with six yards but you'll get a very short pallu. Since the first yard on this drape is obscured anyway you could theoretically sew an extension on a six yard sari to be able to drape this well. I have worn this drape a lot this summer trying to get my brain around it. The first difference you'll notice is that it is wrapped in the other direction, from left to right. Chantal writes that the direction represented wear by a "right handed" caste. There are a few finer points to get a handle on but it's well worth the effort! Step by step instructions on how to drape a Kappulu sari. The start end of the sari is in your right hand. 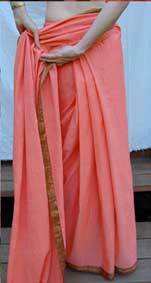 Tie the sari at the waist with a knot at the left side of the waist. Grasp the start edge in the middle of the width and tuck into the waist at the navel. You can arrange the folds neatly around the right hip as they gather into the waist. The remaining sari hangs down on your left side. Fold it at the knot and wrap the upper border to the center back, tucking it into the waist. The sari is for this segment wrong side out. Fold the sari at this center back point and wrap it back around your waist to the front, this essentially has formed one big pleat at the center back. The sari is now again right side out. Continue wrapping all the way around the front and around the right hip until you reach the center back again. Make sure you leave some ease in the top of the sari to keep the grain straight. Hold the center back spot on the top border and bring it around front. This is the center back point you are holding. 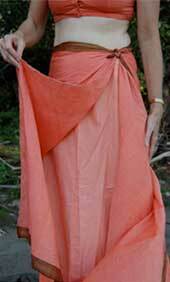 Fold the sari at this point toward you and on the inside to form the first pleat. This corner is where the folds of all the pleats should lie. 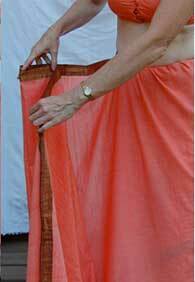 Form 4 - 5 narrow pleats towards the inside of the sari. When you have a nice set of pleats made, make sure to shake them out and line them up along the grain. Depending on the length of sari you are using you can adjust the number of pleats or their width to gain some length of cloth. Grasp the pleat stack with your right hand, bring them around back and tuck in to the waist. Adjust the length to align the bottom borders. Tuck in the top border all the way around the waist and back to the left hip. Draw the remaining sari from the top border back from left to right and grasp in your right hand. Gather up the bottom border towards the top in an informal set of pleats converging at the right hip. Leave some ease in the bottom border so it doesn't drag on the layer beneath it, but not so much that it looks sloppy or billows out, it should be a nice curving arc from the bottom border to the waist. Grasp this bundle of pleats and twist it tight and tuck it into the waist at the right hip. This twisted section should not be more than an inch or two, just enough to secure and tuck into the waist. Where this bundle comes out of the waist towards the back start to fan it back out a bit as you wrap it from the right hip towards the left. The borders may have twisted in the knot, but the only thing to make sure of is that you don't twist the sari inside out. Form a nice fan of pleats across the lower back from the twist to the left side. Continuing to fan these pleats out keep wrapping them around to the front and arrange nicely over your torso with the bottom border forming a harmonious arc on top of the layer beneath it. 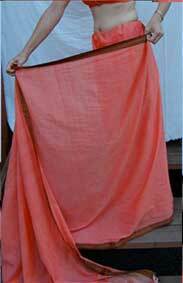 The pallu gets draped over the right shoulder. It can hang free at the back or be drawn over the left shoulder for full coverage. 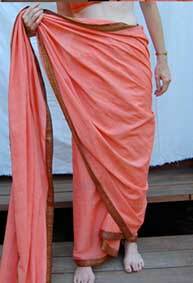 I saw many women wearing this drape with both shoulders covered in Srikakulam, as well as the pallu taken and wrapped around the neck and out of the way. Village women are very casual about their sarees, this is just everyday clothing to them and it is easy enough to hitch and tuck to make working easier. You can drape this sari by tucking it into a petticoat, but it seems to hold better with a waist knot and some rolling of the upper border to secure the twisted tuck!